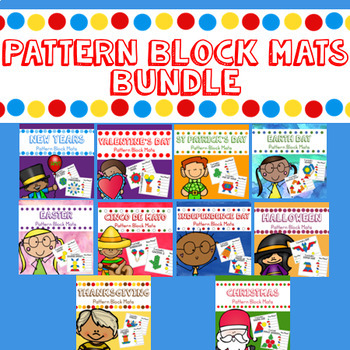 Year long holiday block mats are the perfect themed math center for your preschool or kindergarten classroom. Students create a picture and then count how many of each pattern block shape are included in the picture. Large pattern block mats included for each holiday as well as small cards for some (I will be updating to include in all). 9 -10 picture cards included for each holiday. Different versions to allow for differentiation: colors pattern blocks for students to match, black and white, and no lines to challenge students to find their own pattern blocks to create the pictures. Also includes a recording sheet focusing on counting, addition and comparing numbers.